A low growing species, Grevillea lanigera is commonly known as Woolly Grevillea can be found as either a small shrub, or as a prostrate form which is more usually grown in the garden. Widely found from central to eastern Victoria and along the ranges and southern coast of New South Wales, the species itself varies. Flower colors vary from a pale cream to reds and pinks. A yellow flowering form is also available. The low growing forms of Grevillea lanigera make an excellent as a ground cover plant where they will form a dense matt. With flowers from winter through to spring and occasional flowers in summer to autumn they are a low maintenance plant. Useful in mass plantings or as a specimen in the garden border or rock garden. With a naturally dense growth habit and nectar filled flowers this is a plant that provides a good habitat for for small birds. Best grown in full sun to part shade, good drainage is essential. Once established Grevillea lanigera and its cultivars require little to no extra water and they do not require fertiliser. Not suited to humid or tropical climates. In the garden plants are best tip pruned from a young age to encourage a good dense bushy growth. 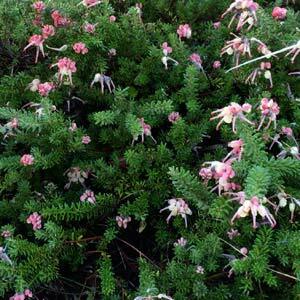 The best time to prune Grevillea lanigera is just after a main flush of flowers. We suggest tip pruning on a regular basis rather than hard pruning. 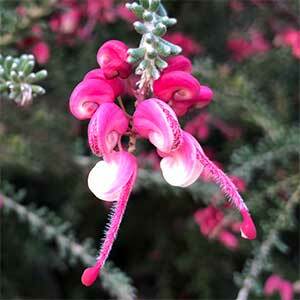 Grevillea lanigera ‘Mt Tamboritha’ is a compact form that will reach around 20cm in height and spread to around 1.5m. Like most forms it will sucker, and will also set viable seed. Botanical Name – Grevillea lanigera. Common Name – Woolly Grevillea. Height – From .4m to 1.4 metres depending on variety. Spread – From .4 metres to 1.4 metres. Flowers – Varying from white through to cream and red. Flowering Time – Late winter into spring is the main flowering period, spot flowering may occur through the year. Foliage – Deep green – evergreen.